I have reviewed quite a few keyboards over the years, and I still really enjoy it as the selection and quality seem to keep going up while the price goes down, a great thing for keyboard enthusiasts. 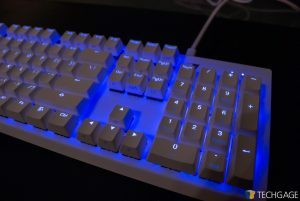 Traditionally, if you were looking at a keyboard with 10 keys that was under $100, you were most certainly getting one with a membrane style switch, or possibly a mechanical switch, Kaihl or other, but not CHERRY. 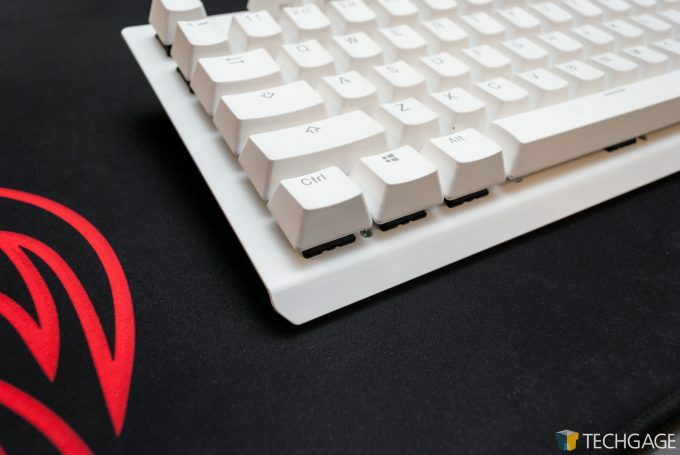 CHERRY have always been the gold standard amongst traditional mechanical switches, as it offers the most reliable and consistent user experience, but with that comes a higher price. So to see a keyboard offer genuine CHERRY mechanical switches at this price point of $79 USD, certainly piqued my interest. You may not know the difference between membrane or mechanical switches, or the differences among mechanical switches (it can be daunting). I won’t cover all of that in this article, but here is a Wikipedia link if you want to learn more. I could summarize this keyboard’s aesthetics in three words: clean and simple. This offering is in white, but TESORO also offers this in black. There are no dedicated multimedia controls, no volume knob, no dedicated macros, just plain and basic functionality. The keycaps have a very standard, lightly textured finish on them, and feel very consistent with just about every other keyboard with CHERRY MX Brown switches. They have a really nice feel, with a light thud once the keycap bottoms out. The TESORO GRAM MX ONE features blue illumination that is configurable by brightness, but also several different patterns if you choose. 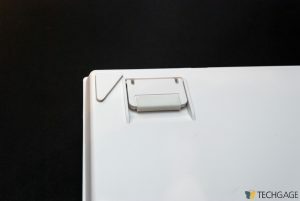 There is a singular connection on the back, to plug in a mini-USB connector. angle the keyboard if you prefer. My initial impression of the TESORO GRAM MX ONE is that it is very well made. One of the “kicking the tires” tests I always do with a new keyboard, is I give it a torsional flex test by gripping it on either end and giving it a twist. On The GRAM ONE, there is a little flex, but it stops immediately and doesn’t give any more. There is no cracking or creaking, an indicator that this is one well made keyboard. Another test that I do on keyboards, is I press the very far end of the spacebar, as far from the center as I can get. If the spacebar registers the stroke as well as it did if you were pressing directly from the center, then you know it is a well-made keyboard. Something else to keep in mind is future customization. 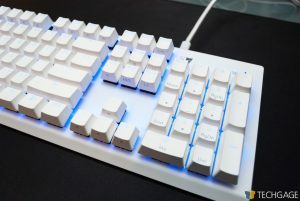 Because this keyboard uses standard CHERRY MX switches, you can always get replacement keycaps, perhaps silver ones for the WASD keys, or whatever you like. Since CHERRY compatible keycaps are interchangeable, your options are wide open. 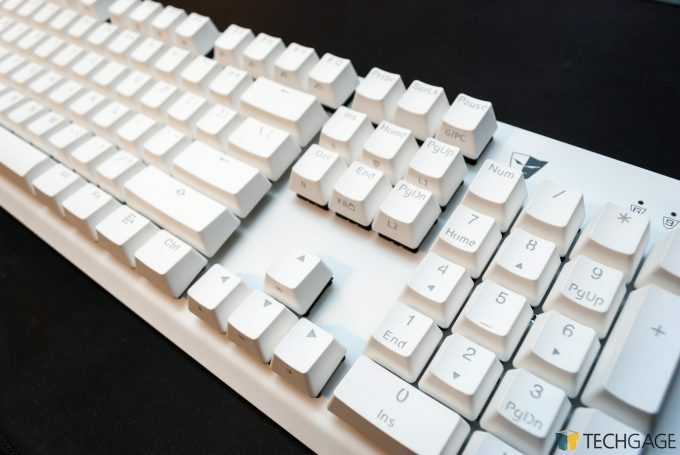 Usage of this keyboard is very much par for the course with any keyboard with CHERRY MX Brown switches, which is one great thing about buying a keyboard with CHERRY switches, you always know what you are going to get. Most keyboards with mechanical switches have a thud when the keycap travels to the bottom of the actuation, and this is no different. I installed some blue rubber o-rings which quieted this down considerably, although it wasn’t loud to begin with. There is no integrated wrist wrest on the GRAM MX ONE, so that is something to keep in mind. I found that I definitely needed an ergonomic wrist wrest. Luckily these are cheap and easy to find, so it wasn’t an issue for me. 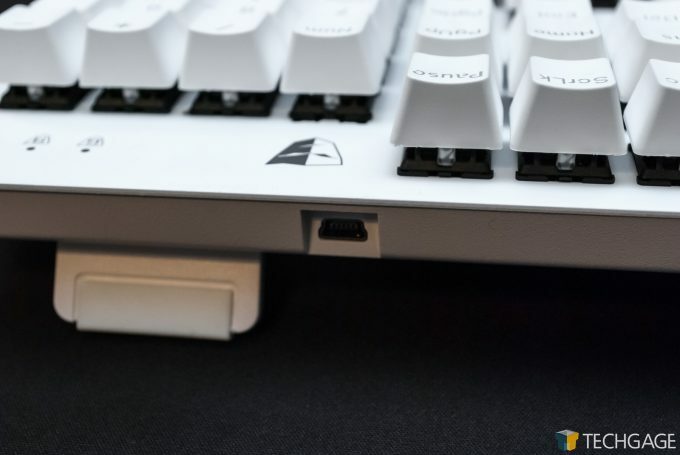 There is no companion software for this keyboard, but you wouldn’t need it anyway as you can easily control the lighting and other features from the keyboard itself, with the help of the included quickstart guide. If I had to give this keyboard one definite criticism, is that the cord is detachable. I don’t really see the need for the cable to be detachable. The reason I bring this up, is I have had a keyboard fail in the past that had a similar construction. The issue is, if the cord moves around a lot, there just isn’t any relief on the end of the cord, so the connector itself carries the load of the cord moving from side to side. 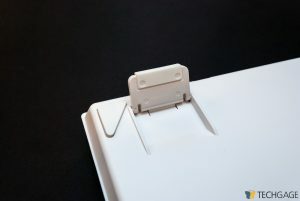 This connector on the TESORO GRAM MX ONE seems to be nestled very securely into the chassis, so my hesitation may be unfounded here, but I thought it worth mentioning. I always prefer integrated cables for this reason, but your mileage may vary. In closing, this is a fantastic keyboard, even more so when you consider the budget. 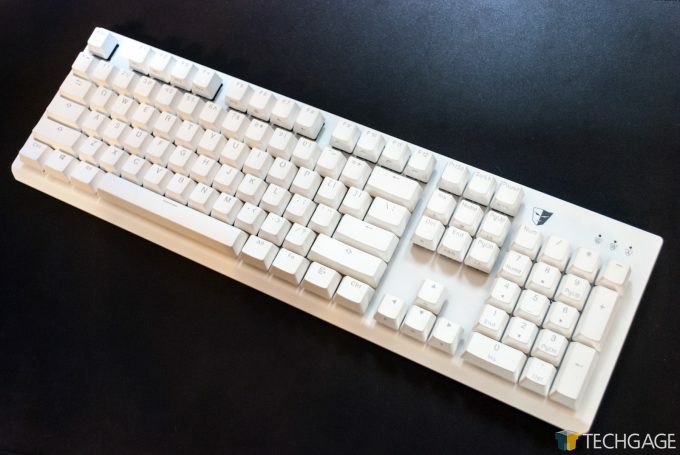 For my day to day, this keyboard is a little too minimal for my taste, but if you aren’t looking for frills and just want an affordable well made keyboard with 10 keys, I sincerely recommend you give this TESORO a closer look.